This priest was the son of the author of verse No. 74. 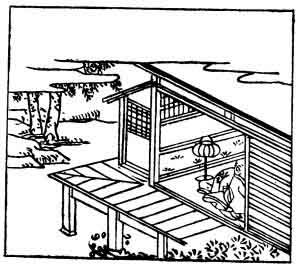 He describes in this poem a sleepless night, when he looks in vain to catch the first glimpse of daybreak through the joints of the sliding screens, that form the walls of a Japanese house. But in the picture, as will be noticed, one of the sliding screens is removed, in order to show the priest within.